Seoul, South Korea is one of several cities experimenting with new waste management policies that will encourage people not to buy food they don’t need. Photo by Seoul Korea/Flickr. It would take farm land the size of Mexico just to grow the amount of food that humans produce, but do not eat, every year. More food goes uneaten at the consumption phase of the supply chain—in places like homes, restaurants and cafeterias—than at any other stage. Almost all urban areas experience high levels of food waste—food that is fit for consumption when it reaches consumers but is discarded before or after spoiling. While food waste presents significant challenges, addressing waste also provides an opportunity for growing cities to reduce their carbon emissions, curb deforestation, and mitigate water withdrawals caused by agriculture. If current trends continue, the world will need to increase food production by 70 percent by 2050. Growing that amount of food will put a significant strain on the planet. Food production is emissions-intensive because it converts lands—such as forests and savannas that store carbon and preserve ecosystems—into pasture or crop land. For example, farmers are chopping down Indonesia’s rainforests to grow crops like palm oil, making Indonesia the world’s largest carbon emitter per unit of GDP. In addition, 13 percent of the world’s 2010 carbon emissions came from agricultural activities like raising cattle, using tractors, and producing and using nitrogen fertilizers. Including land conversion, agriculture contributes 24 percent of global greenhouse gas emissions, uses 37 percent of Earth’s land, and accounts for 70 percent of water withdrawals worldwide. In 2010, agriculture accounted for 24 percent of global greenhouse gas emissions, 37 percent of the Earth’s landmass, and 70 percent of water withdrawals. 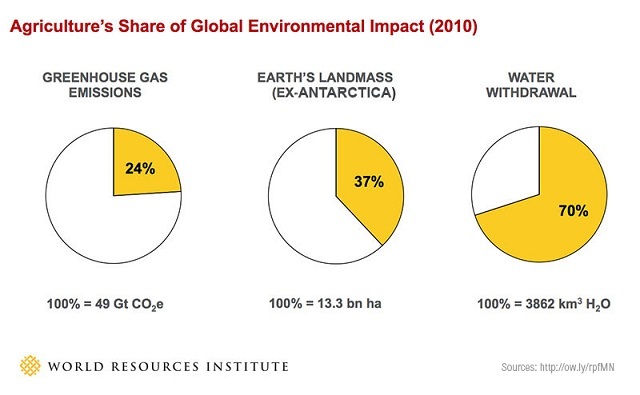 Graphic by World Resources Institute. Given the staggering effect that food production has on the environment, reducing food waste and easing the growing need for food production can move us toward a more sustainable world. According to The Royal Society, consumers in developed economies waste more food due to the low cost of food relative to disposable income, high standards for the appearance of food, and a lack of understanding of the realities of food production. Urbanization introduces these three factors into consumer behavior because urbanites earn more money than rural workers, buy more food from supermarkets that have high food appearance standards, and live further from where their food grows. To make the food waste challenge even more difficult, the UN projects that by 2050, 2.5 billion more people will live in urban areas and that urbanites will make up about two-thirds the world’s population. As a result, food waste is expected to rise significantly by 2050 in most cities. Food waste is already growing worldwide. For example, food waste already comprises 50 to 70 percent of municipal solid waste in several Chinese cities, including Beijing and Shanghai. Furthermore, consumers in underdeveloped areas sometimes lack refrigerated storage in homes or other methods for preserving food. Fortunately, some local governments, NGOs, and private companies are already exploring innovative methods of managing and reducing their food waste. For example, some organizations are redistributing food to people in need. FoodBank South Africa rescues more than 4 metric tons of food annually and distributes more than 14 million meals with the help of local non-profits in Cape Town, Johannesburg, and Durban. Seoul, South Korea is implementing a policy to charge people, organizations, and restaurants for their food waste. This will nudge restaurants to reduce their portion sizes and encourage people not to buy food they don’t need. 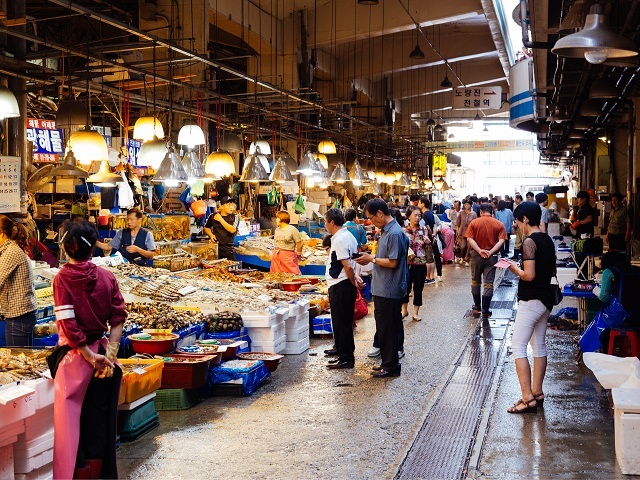 In February 2014, Hong Kong set a goal to reduce waste from food and its inedible parts (bones, rinds, peelings, etc.) by 40 percent by 2022 from 2011 levels. The report focuses on raising awareness to limit food waste and recycling food waste by composting it or burning it to produce energy. For example, 75 percent of inmates at the Lo Wu Correctional Institute now volunteer to receive smaller portions of food, saving 500 bowls of rice per day. Momentum is building for cities to urgently address growing global food waste. For example, the Waste Resources and Action Programme (WRAP) has calculated that uneaten food costs the world up to $400 billion annually, providing a huge financial motive for business to act. The World Resources Institute is leading the development of a Food Loss and Waste Protocol, which will enable cities and other entities to report how much food waste they create in a credible, practical, and internationally consistent manner. Finally, the current draft of the UN Sustainable Development Goals (SDGs) contains a target to “halve per capita global food waste at the retail and consumer level” by 2030. Cities play an indispensable role in combating food waste and helping feed 9.5 billion people with fewer carbon emissions and minimal impact on natural resources.